An estimated 242 people were killed in traffic collisions on Los Angeles streets last year, according to provisional data from the city's transportation department. That's a slight decrease in deaths from the previous year, but speaks to the long road ahead to meet Mayor Eric Garcetti's goal of zero traffic deaths by 2025. 127 were pedestrians. That's down slightly from 134 deaths in 2017. Pedestrian deaths have outnumbered motorist deaths on L.A. streets every year since 2010. 21 were bicyclists. That's up from 18 people killed the previous year, and also represents an 110% increase in cyclist deaths from 2003. LADOT did not make specific data on 2018 motorcyclist and motorist deaths available. 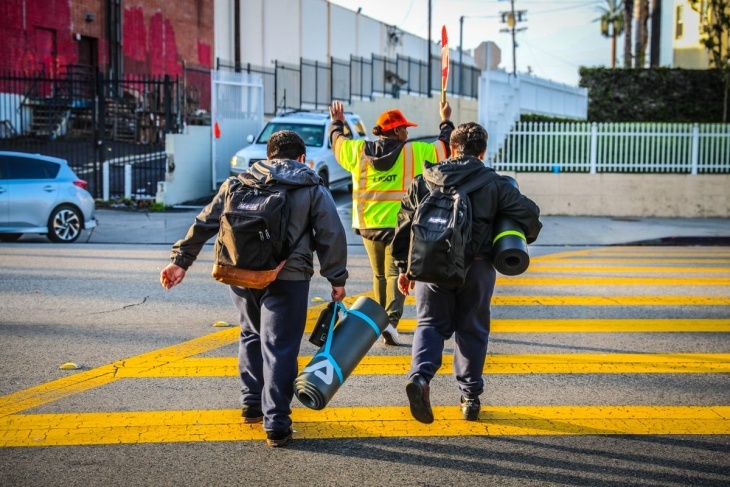 "Our number one job at LADOT is to eliminate fatalities, so LADOT is working on safety projects near schools, senior centers, and on our high injury network," a department spokesperson said in a statement provided to LAist. "We're proud of our work to slow down speeds and redesign streets, and we have a lot more work ahead of us." Dana Variano, a spokeswoman for the Los Angeles County Bicycle Coalition (LACBC), said the newly released data was "discouraging, but not surprising," given what she and fellow street advocates see as a lack of both political will and "a cohesive program... that will actually get us to this very reachable goal." Street safety advocates contend the city's traffic safety initiative, Vision Zero, is falling behind on its mission to "end all traffic deaths and serious injuries by 2025." "Declaring a city 'Vision Zero' does nothing unless there's follow-up," Variano said. "These things really need to be led from above by our city and county leaders." "These traffic fatalities are not accidents. We know why they're happening and we know how to solve them." WHAT'S HAPPENING WITH VISION ZERO? The initiative was created through a 2015 executive order by Mayor Eric Garcetti, who outlined a goal of "reducing traffic fatalities citywide by 20% by 2017, prioritizing pedestrian fatalities involving older adults and children." From the year the program was announced to the end of 2017, overall traffic deaths rose about 32% and the number of pedestrians killed surged from 74 to 134 — an increase of more than 80%. Anna Bahr, a spokeswoman for Mayor Garcetti, noted that while the Vision Zero program was announced in 2015, "it wasn't launched (meaning when engineering improvements were made and enforcement efforts started) until January 2017." And in that first year of a fully operating Vision Zero, overall traffic deaths did decline by almost 6% from 2016, but 18 more pedestrians were killed in collisions. Bahr recognized that the city had fallen short of its 2017 mission, but said officials will continue to push traffic safety improvements until they reach their overall goal. "In the first three months of 2019, fatal traffic collisions are already down by more than 10%" from that same time period in 2018, she told LAist. LADOT has been concentrating on the "High-Injury Network" — streets that make up about 6% of the city's roadways but account for 65%of all traffic deaths and severe injuries in L.A., according to city officials. Since the start of the program in 2017, the city has also "made more than 1,000 road safety improvements," according to Bahr, and recorded a "22% decrease in DUI-related fatalities." "We will continue to pursue our goal of zero traffic deaths until we meet that mark — because loss of life and severe injuries resulting from traffic collisions are preventable outcomes we can address," she said. The latest traffic death data from LADOT have not been presented to the public on the Vision Zero website. In fact, the website and the program's social media pages have been mostly inactive for the past seven months. The last post under the program's "Recent News" section was published Aug. 7. The Vision Zero Facebook page has been dormant since September 2018 and the Twitter account only had a handful of tweets since October. LADOT's muted presence on traffic safety has been noticed by community members and safety advocates, including LACBC. "It is a little bit confusing," Variano said. "The silence that is being expressed to the community... is something that we hope will end soon." Asked about that, LADOT officials say they're "working on revamping our online presence (both website and social media)" to make it easier for the public to navigate safety initiatives and street projects planned around the city. That includes building a new web platform "to house all street related projects on one website," department officials said in a statement. "People shouldn't have to chase down information on multiple platforms just to understand what projects are happening in their neighborhood," the statement said. That digital revamp had been slated to launch this month, but has been pushed back to May, according to an LADOT spokesperson. Once it does launch, officials say the public "can visit the website to learn about Vision Zero projects and can also find information on plazas, parklets, play streets, and great street projects happening nearby." But the new website isn't the only change coming to the Vision Zero program. Variano said she and other street safety advocates have attended community meetings with LADOT staff, who spoke plainly about how the first couple years of Vision Zero have not worked as well as they'd hoped. That's leading LADOT to pivot their approach to the initiative and work to bridge gaps in community engagement. 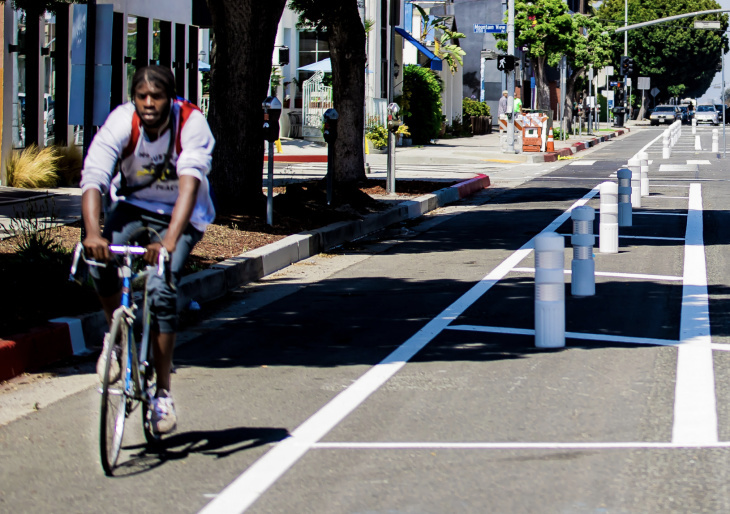 "We've spent nearly two years redesigning our planning process to achieve an authentic and robust community engagement strategy," an LADOT spokesperson told LAist. "The full implementation of this community engagement approach has recently begun, with a document detailing the strategy set to come out later this year." Some of their recommended strategies are spelled out in a memo to the City Council in January, including a new Vision Zero website and additional staff positions to focus on community engagement.